$2.00 for your first $200. Why not? 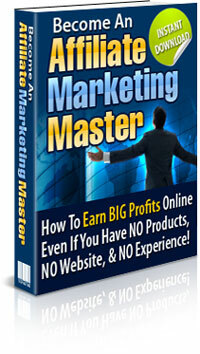 At last, the real secrets to becoming an affiliate marketing master! You’re about to discover the shockingly simple formula to become a master affiliate and racking up sales and profits, even if you have no skills, no knowledge, and no experience whatsoever! Now you really can quit that boring day job and live the life you've dreamed of! Finally, a complete guide to affiliate marketing that will show you exactly what to do even if you have no website, no products, and no experience. You are about to uncover the real secrets that master affiliates have been using to generate online fortunes. Let’s cut straight to the chase here. You've heard the stories of people making thousands of dollars every week from affiliate marketing, and I'm sure you'd like to get your share. Whether you are currently earning profits as an affiliate or just eager to get started, I am about to unleash the best kept secrets, and I am going to give them to you so YOU can PROFIT. What you are about to discover will change the very way you think about marketing and more importantly will help you generate real online profits. I'll Show You Step-By-Step How You Can Become An Affiliate Master No Matter How Hard You've Tried Before. This is a step by step guide that will open your eyes to the real world of affiliate marketing. You will discover exactly what techniques work and what ones don't.